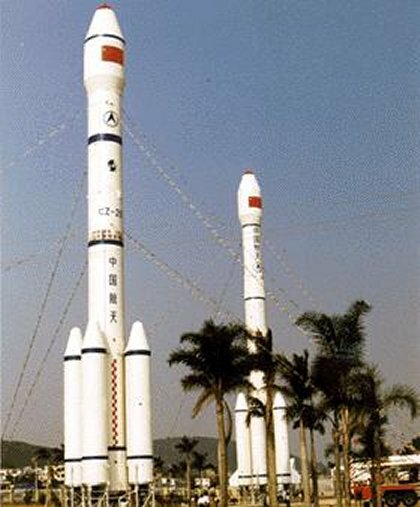 The Long March 2E was a two-stage launch vehicle with four strap-on boosters, and was the most powerful launch vehicle for LEO missions in China. Its LEO launch capability was 9,500kg. 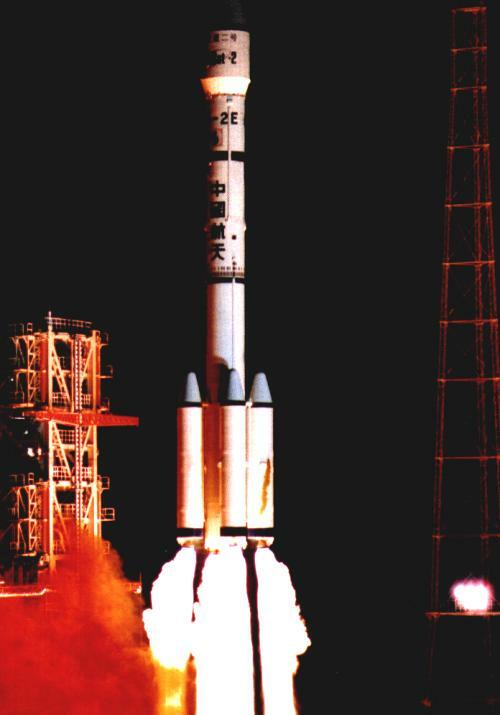 Long March 2E (LM-2E) was a two-stage launch vehicle with four strap-on boosters, all employing UDMH and nitrogen tetroxide. LM-2E, with a solid perigee kick motor (EPKM), was capable of sending spacecraft with a mass up to 3500kg into Geosynchronous Transfer Orbit (GTO). The development of Long March 2E was started in late 1988. It was based on the mature technology of LM-2C and LM-3. Its LEO launch capacity reaches 9,200 kg. 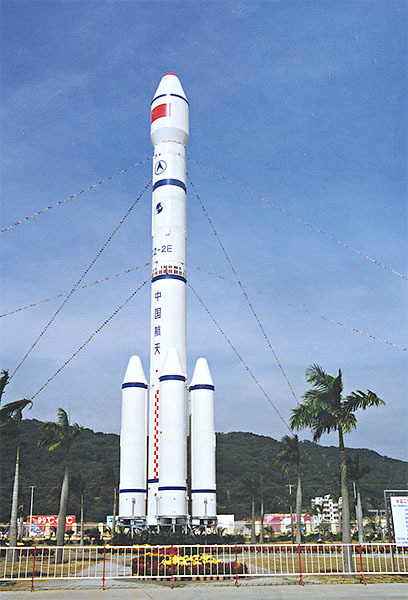 The development of the LM-2E was based on the mature technology of previous versions of Long March launch vehicles. Besides the vehicle structure, the LM-2E has several key functional subsystems, including Engine system for propulsion, Propellant Utilization system, Guidance System, Attitude control System for vehicle stabilization and trajectory control, as well as Telemetry System and Ground Tracking and Control. 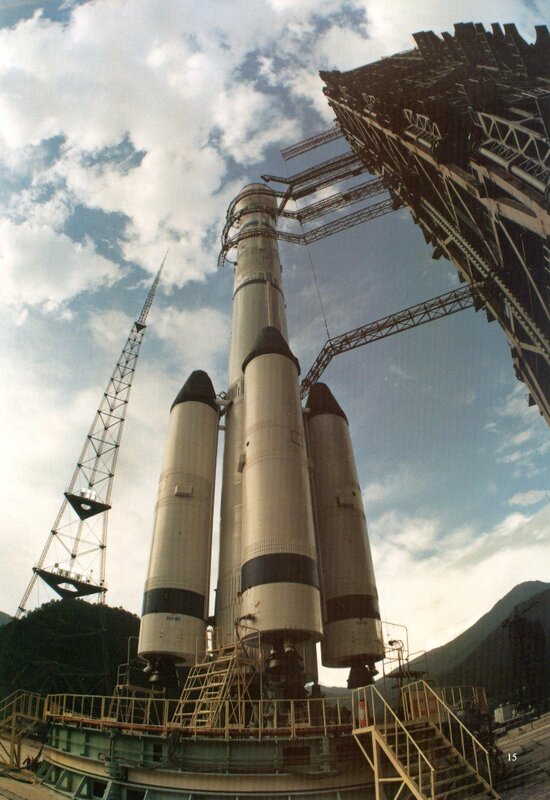 In 1990 the CZ-2E variant was introduced to give the CZ-2 series of launch vehicles a GTO capability which was specially designed to accommodate Western GEO satellites. The strap-on stages each use a single YF-20B engine which was an improved version of the main engine design used on the first stage of the CZ-2C. Four YF20B engines are combined to make the YF-21B which powers the first stage of the core vehicle, which was more than three meters longer than the CZ-2C first stage. 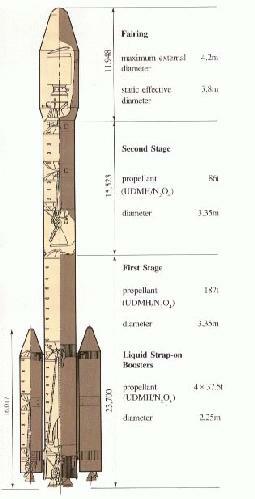 The CZ-2E second stage was also based on its CZ-2C counterpart with an uprated main engine (YF-22B) and larger propellant tanks carrying more than twice the load of the CZ-2C second stages. Finally, a small perigee kick stage was available for payload transfer from a LEO parking orbit to GTO (References 159,162, 163, 166-169). The CZ-2E has a 9.2 metric ton LEO capacity and a 3.1-3.4 metric ton capacity to GTO depending upon the perigee kick stage selected. To perform GTO launch missions, CALT offered a new version designated LM-2E/EPKM, which had a solid perigee kick motor [EPKM]. LM2E/EPKM was capable of inserting a spacecraft of 3,500 kgs into GTO with orbital inclination of 28 degrees. On July 16, 1990, the first test flight of LM-2E was successfully performed at XSLC, sending a the small (50 kg) Pakistani Badr piggy-back satellite into its predetermined LEO. The main payload was a dummy payload simulating Optus B satellite and Star-63F solid rocket perigee kick motor. An attempt to test the new Chinese perigee kick stage attached to a dummy payload failed. On March 22, 1992, the launch attempt of the Australian Optus B1 (HS-601 made by Hughes Aircraft Company) on LM-2E was aborted due to the problem of engine ignition device for Booster-1 and Booster-3. Optus-B1 was successfully launched by the refurbished LM-2E on August 13-14, 1992. The next flight on 21 December 1992 failed when a malfunction of the payload or shroud occurred less than one minute into the ascent. The third flight of LM-2E was successfully conducted carrying Aussat-B2 (Optus-B2) plus Star-63F as payload. At 47.7 second during the first stage flight, the satellite exploded and the fairing was damaged by the explosion. Despite the violent nature of the failure, which left a large portion of the payload scattered down range, the CZ-2E second stage continued to function and reached a nominal LEO parking orbit. The LM-2E finally placed the remains of the payload (mainly the Star-63F) into the desired orbit and all the orbit accuracy was within the required range. The vehicle flew again successfully on 27 August 1994 with Optus B3 (References 170-179).The PRC did not implement all the changes suggested by Hughes for the Optus B3 launch in 1994. Following the Optus B2 failure, Hughes engineers recommended reinforcing the fairing. But the PRC chose to install additional rivets instead of structural changes. The the PRC did not implement the recommended changes to reinforce the fairing prior to the Apstar 2 launch because to do so would have been an admission of fault in the Optus B2 failure. . The PRC viewed the nose cone portion of the fairing as a one-piece, complete hemisphere. But the nose cone was manufactured in two sections with a slit in the middle. 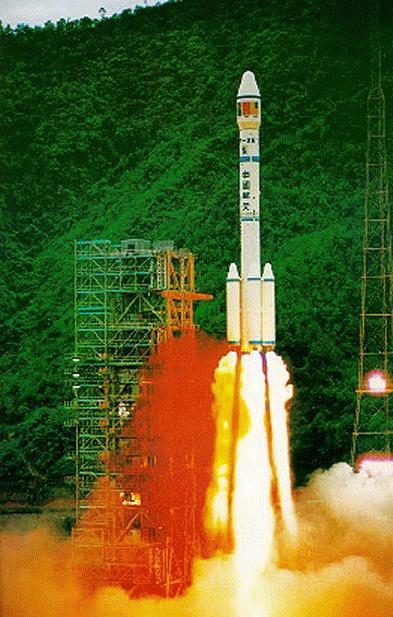 After its successful launches of the Long March (Chang Zheng) 2E in 1994, China suffered a serious setback on 25 January 1995 with the explosion of an LM-2E approximately 50 sec. after launch, that killed six persons near the Xichang Satellite Launch Center and injured 27 others by falling debris. This was the fifth flight of the Long March 2E rocket, and the second failure. The prior failure in December 1992 was of a Long March 2E rocket carrying the Optus B2 satellite, also manufactured by Hughes. In both cases, observation of the flight data and the rocket debris indicated that an explosive force had destroyed the forward part of the rocket where the satellite and the covering fairing, which is a part of the rocket, were located. Because of similarities to the Optus B2 failure in 1992, Hughes engineers believed right away that the PRC rocket fairing had again failed. The changes made by the PRC in the number of rivets had not been adequate to prevent the Apstar 2 launch failure. Hughes had added instrumentation to the satellite after the Optus B2 failure. The added instrumentation helped Hughes determine the cause of the failure. Hughes Vice President Donald Cromer appointed a Failure Investigation Team. The failure investigation began immediately and continued until around June 1995. At the outset of the investigation, Hughes officials considered that a State Department license might be needed in order to conduct the failure investigation even though the launch had been licensed by the Commerce Department. Despite the shift to Commerce Department in 1993 of licensing jurisdiction for certain commercial satellites, the State Department still was solely responsible in 1995 for the licensing of any technical data that could improve PRC rockets. Hughes felt that it could not afford to allow the China Academy of Launch Vehicle Technology to present its argument to the insurance companies and Hughes' customers, such as the PRC-controlled Asia Pacific Telecommunications Satellite consortium, without providing all of the evidence - especially when the evidence pointed to a failure of the Long March 2E rocket and not the Hughes satellite. The PRC engineers, however, did not want to present any findings that led to the conclusion that the Long March 2E fairing was to blame for the failure. The PRC engineers feared that if this were to occur, then they would not be able to get insurance for future Long March launches. By July 1995, Hughes had definitively concluded that the failure of the Long March 2E rocket on the Apstar 2 launch was caused by the rocket's fairing. Specifically, Hughes determined that the aerodynamic forces from the velocity of the rocket, combined with the winds aloft and high wind shear, ripped the fairing apart. PRC Minister Liu Jiyuan, Director of China Aerospace Corporation, reacted emotionally to statements by Hughes indicating that the Long March 2E fairing was the cause of the failure. Minister Liu, who is influential in awarding communications satellite contracts in the PRC, said that China Aerospace Corporation would never do business with Hughes again. On July 23, 1995, Hughes and the PRC released a joint press statement regarding the Apstar 2 failure. The statement was signed by PRC Minister Liu and Hughes CEO Dorfman. In the statement, Hughes and the PRC essentially agreed to disagree over the cause of the failure. Hughes cited high winds affecting the fairing as the most probable cause of the accident. The PRC cited a satellite and rocket interface problem. According to Hughes, "The most probable failure scenario was initiated by high aerodynamic loads initially causing the fairing downrange vertical separation line to open and the dome to crack. As the fairing continued to collapse, it caused the spacecraft structure to fail, crushing the propellant tanks. The resulting fire caused the destruction of the spacecraft and the secondary destruction of the booster. The most probable root cause of the failure is the deficiency in the fairing longitudinal split line design requirements and/or design. The causes of the Optus B2 failure in December 1992 and the Apstar 2 failure in January 1995 are identical. There are a number of concerns relative to the design of the LM-2E fairing. These include the rivet strength of the separation zipper, the nose cap split line and the hammerhead fairing aerodynamic shape. There are additional concerns regarding the launch vehicle to spacecraft interfaces, such as design of the launch vehicle Marmon clamp separation band, fairing vent area, flying a high angle of attack and lack of detailed launch weather criteria." Hughes chose not to initiate any discussion or review of the matter with State Department or Defense Department officials before granting approval for Hughes to provide the fairing information and report to the PRC. The basis for this was that the Hughes information contained no design or production data. This approval was a mistake, since the Hughes report represents an in-depth analysis of the design deficiencies of the fairing, and the executive summary discusses design changes that should be made to the fairing for future PRC launches. On December 7, 1998, the Department of Defense completed an initial assessment of the January 1995 Apstar 2 launch failure. The assessment was based on the Hughes Apstar 2 reports that had been provided to the Defense Department by the Commerce Department in June 1998.170 The Defense Department assessment concluded that the technical information provided to the PRC by the Hughes Apstar 2 failure analysis can be applied to either PRC rockets or ballistic missiles. Another LM-2E was launched successfully on 28 November 1995, carrying the Lockheed Martin comsat Asiasat 2 into geostationary orbit to provide services for the Hongkong-based Asia Satellite Telecommunications Co. Ltd. Because of the lack of information on the cause of the prior failure (as well as a similar one in December 1992), the insurance premium for the launch was 27 percent, significantly higher than the then-current industry average of 17 percent to 20 percent. On 28 December 1995, a third LM-2E carried the TV-broadcast satellite EchoStar 1 successfully into orbit. 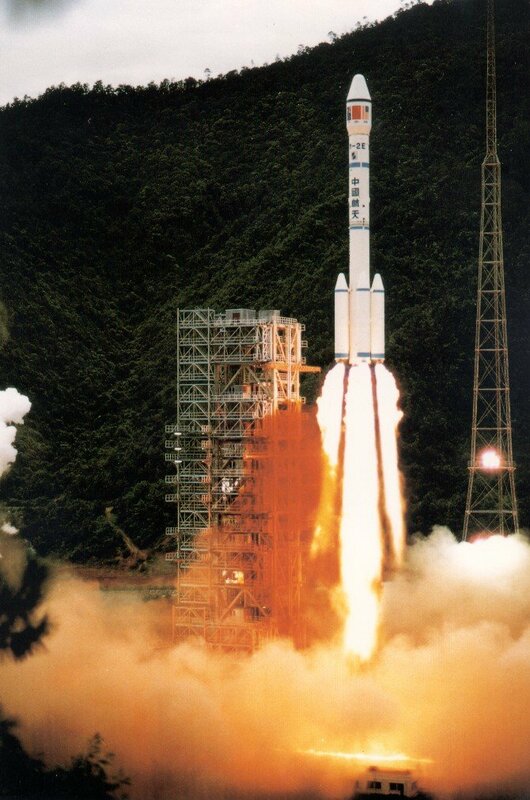 But Long March program suffered another blow on 4 September 1996 when Hong Kong's Asia Satellite Telecommunications Co. (Asiasat) filed an insurance claim of $58 million for damage to AsiaSat-2 caused by an alleged "rough ride" during its launch in November 1995 by a Long March 2E (see above). AsiaSat claimed that excessive acceleration caused by the launcher knocked the antenna feed horns of the spacecraft's nine Ku-band transponders out of alignment, reducing effective coverage and transmission power to the company's customers. A number of international customers cancelled their geosynchronous launch contracts with the Chinese carrier. Restoration of market confidence in the new booster, particularly by the international insurance community, depended on the success of China in launching its backlog of commercial payloads in 1997. In June 1997 Hughes Telecommunication and Space Co and China Great Wall Industry Corp. agreed to send at least five US-made satellites into orbit on Long March rockets. The cooperation agreement came after several setbacks in the Chinese satellite industry. Recent successful launches using the Long March rockets boosted confidence in the Chinese rockets. Hughes was the first foreign user of Long March rockets, and now, more satellite manufacturers were considering working with Great Wall Industrial. 167. P. S. Clark, "Chinese Launch Vehicles - Further Details", Jane's Intelligence Review, June 1993, pp. 274-275. 168. LM-2E Launch Vehicle, specification sheet distributed by China Great Wall Industry Corp., 1992. 169. Long March-2E, specification sheet distributed by China Great Wall Industry Corp., 1991. 170. Zhongguo Xinwen She News Agency, 23 December 1992. 171. Xinhua News Agency, 21, 22, and 24 December 1992. 172. Wen Wei Po, 27 December 1992. 173. Guangming Ribao, 2 February 1993, p.1. 174. Zhongguo Xinwen She News Agency, 23 March 1993. 175. P. Proctor, "U.S., China Examine Failed Launcher Parts", Aviation Week and Space Technology, 11 January 1993, pp. 60, 63. 176. C. Covault, "Chinese Rocket Shroud Breakup Caused Long March Failures, Aviation Week and Space Technology, 18 January 1993, p. 28. 177. "Restrictions Slow Long March Probe", Aviation Week and Space Technology, 8 February 1993, p. 25. 178. P. B. de Selding and P. Seitz, Investigators Fail To Find Cause of Optus Loss", Space News, 8-14 February 1993, pp. 3, 20. 179. "Hughes Clears Optus Satellite in Long March Accident Probe", Aviation Week and Space Technology, 12 April 1993, p.60.